For all you cat lovers…. I wanted to do a special post for all my feline anipals. 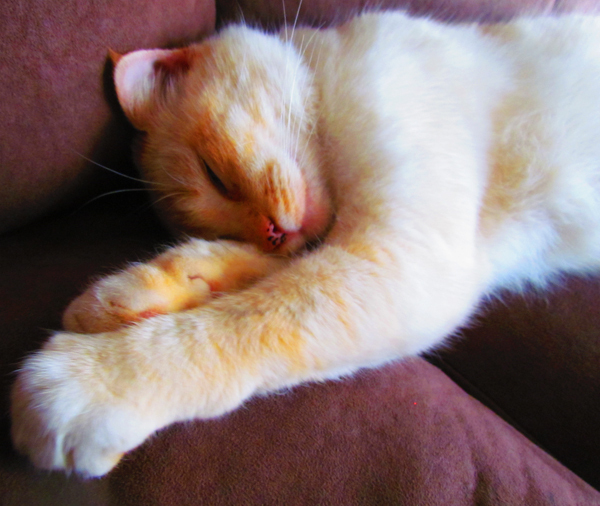 If you regularly follow me on Twitter, you have heard me tweet about my cat brother, Mr. Pumpkin. He’s also made an appearance on this blog several times. (When my Mama was writing this blog, she talked about him in Mr. Pumpkin and Gracie’s Diaper Cake Adventures, and he was also in our Christmas photos two years ago (2010). He is a very beautiful cat – or at least Mama thinks so. 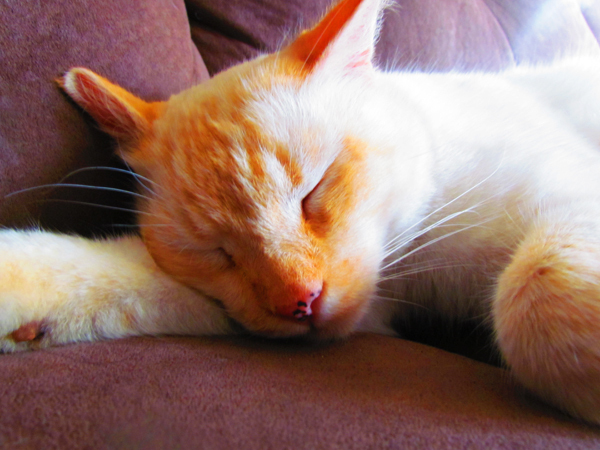 He used to be more white a few years ago, but now he’s become very orange. Mostly on his face, parts of his paws and tail. He also has freckles on his nose. Mama tried to rub it once, but it never came off… so we just assume he’s got freckles. He used to be an alley-cat that was abandoned, and the neighbors were feeding him. He wasn’t neutered when Mama decided to adopt (or as Mama’s friend says “cat-napped” him from the streets), but he can no longer make kitty babies with his many cat girlfriends (cuz he is such a handsome fellow). Anyway, he jumped into Mama’s car one day, so she decided to keep him. Since he has alley cat tendencies, he is now an outside-indoor cat. We tried to keep him inside all the time, but he wouldn’t stay inside. He meowed and meowed at the door, and try to run out every chance he got. He used to pee on Mama’s bed and on this couch (which had to be thrown away), because he was so mad that we were keeping him inside all the time. Mama took him to the vet and was like, What gives? This cat has been fixed. He shouldn’t have these roaming tendencies. The vet gave her meds for a UTI (yes – cats get urinary tract infections, too), but said that some cats just like to “mouse” (like kill mice and birds, and hunt for fun. It’s in their nature, I guess). So, after a year of keeping him inside all the time, Mama gave up and so now he is an indoor and outdoor cats. Although you can’t see it in these photos, he has a collar that we wears all the time that has his name and Mama’s phone number. So, if people think he’s a stray, they know he’s not. He belongs to us. Before you get all mad that he’s an indoor/outdoor cat, you should know that we live in a very secluded street – not many cars are around, and other neighbors also let their cats out. His best friend is a bobtail cat across the street – who is outside all the time. We don’t know his name, but we call him the Vampire, because sometimes he likes to be mean to Mr. Pumpkin. Mr. Pumpkin always comes home every night, and he does spend a lot of time in the trees in our front and back yard. He also enjoys climbing on the roof of the house and sleeping – and sometimes on Mama’s car. Sometimes, when the family goes on a walk around the neighborhood, Mr. Pumpkin walks with us. He leaves the house with us, follows us on our walk, and returns home with us. It is very strange…. But he’s Mr. Pumpkin. He loves us and we love him. 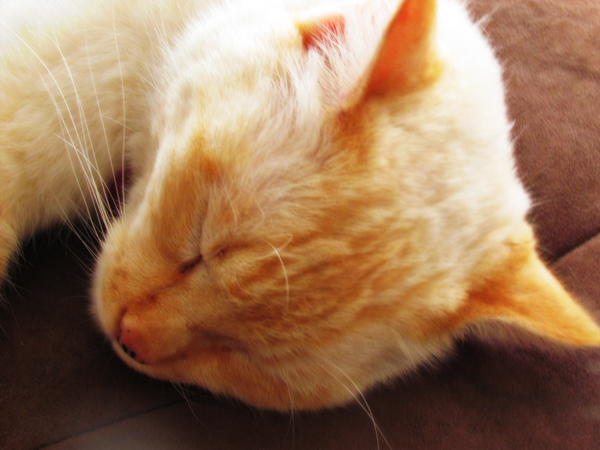 When he is home, he sleeps A LOT. I get kinda annoyed, because I want to play with him. I put my paws around his neck, but he doesn’t seem to mind. He just walks away from me. And he used to sleep inside my pink doggie bed, but now he likes the sofa. Cats are weird – that’s all I have to say. Don’t you think he is a handsome fellow? I think he is quite handsome, but I do think that I am prettier. My head looks bigger in the below photo, but my head is really not that big. 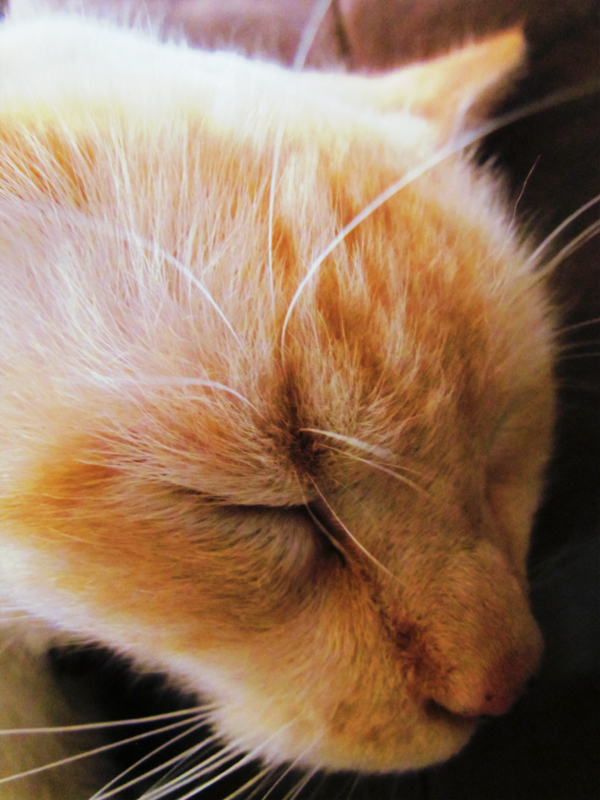 Sometimes, we like to sleep next to each other – my cat brother and me. 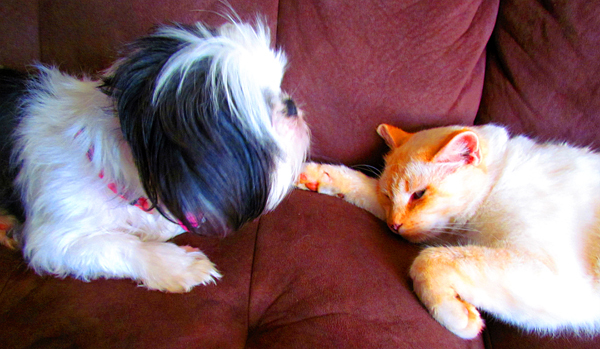 Shih Tzus just love everyone – cats included! Here I am – wanting to play, and Mr. Pumpkin wanting to sleep. 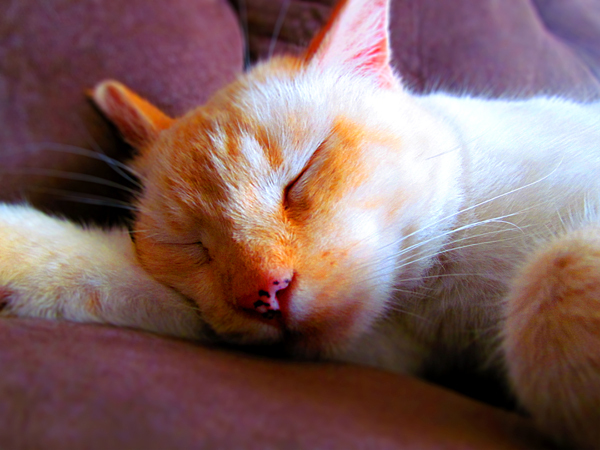 I hope you enjoyed my photographic introduction to my cat brother, Mr. Pumpkin. Tomorrow, it’s back to me! Very nice to meet my namesake Mr. Pumpkin. I have a cat brother Menace, but he is only allowed to blog on Menace Mondays. You need to set limits with cat brothers. Mr Pumpkin is so cute. I would like to cat but i cant because my momma is allergic to cats.